I'm working up to this. OUTSIDE the Chinese Youth Society of Melbourne clubhouse in eastern suburb Laburnum, barrel-chested patriarch Bill tests my biceps and gives a friendly snort. I’m here to train with his squad of lion dancers, who are gearing up for the Chinese New Year performance in Chinatown, but he seems to be implying I have a ways to go. Inside, around 30 members dressed in muscle shirts and pants are leaning against walls and gasping. They’ve just been on a sprint around the neighbourhood in the searing hot sun, and the pain’s only just begun. While they’re recovering, I have a nose around the clubhouse, which is decked out with banners, newspaper clippings about processions, and photos of footy teams through the decades, not to mention a stonking collection of traditional weaponry. The club’s been going since 1968, so almost everyone here’s grown up with it and can drop in and out. There’s no shortage of older souls to keep a rambunctious, lost young kid out of trouble. 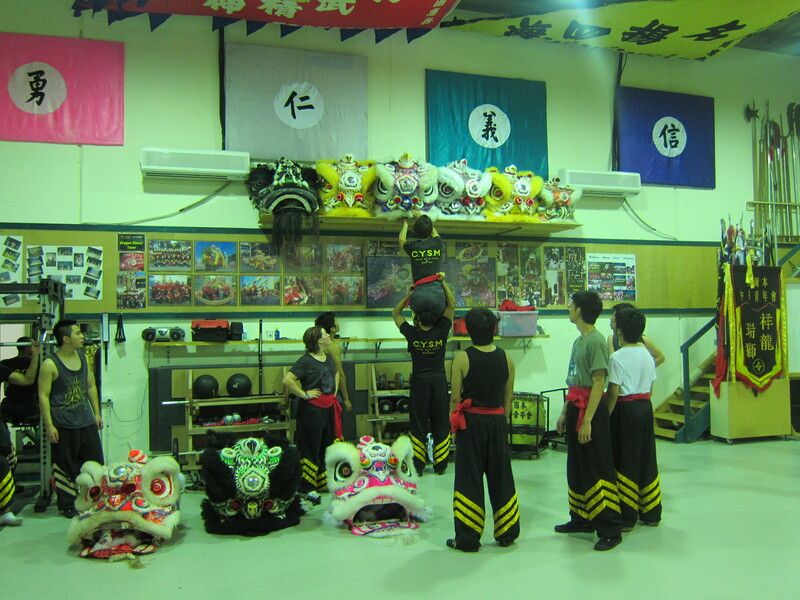 Everyone present today is training to be a lion dancer, but separate troops who perform as dragon dancers and unicorn dancers also train here. There’s rarely any swapping of allegiances, much like you’re born into barracking for just one footy team. 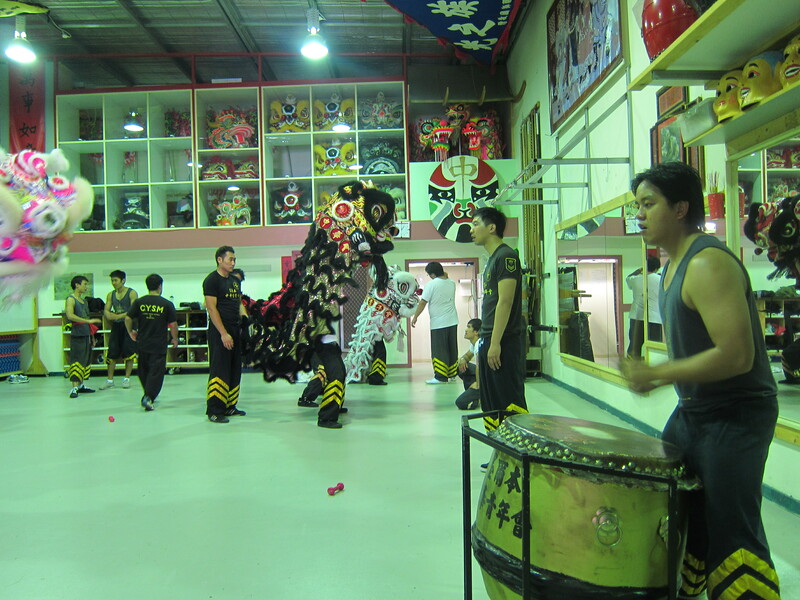 As well as the traditional performance for the Chinese New Year, the club might be paid to come out by a shop or restaurant that’s opening, to scare away evil spirits (hence also the banging of drums and letting off of firecrackers). It’s complex stuff and you really need to be comitted (Bill’s son Derrick even has the logo tattooed on him). You also need to be really, really, like really, fit. 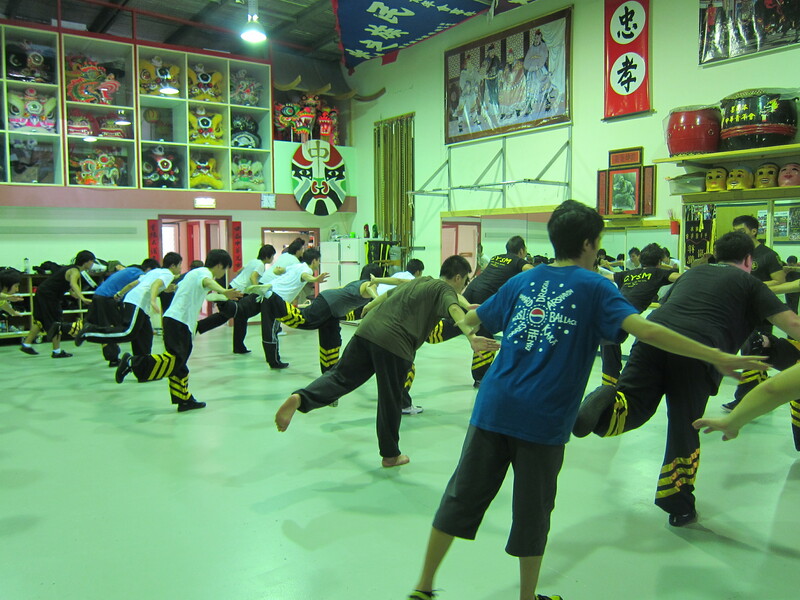 Hung Kuen is the martial art of choice here, and the members practise it when they’re not focusing on a performance. Back in China the two principles are sometimes combined – rival lion dancer clubs will fight each other in the street, in costume. After the push-ups, sit-ups and jumps, we work through the various stances needed to operate a lion: ‘horse’, ‘golden chicken leg’, ‘dragonfly touches water’. It’s all about keeping a centre of gravity to maintain balance on various limbs for aeons. My host, Huy, reckons I look more like a crane than a dragonfly, but given that he can’t stop yawning from “lack of oxygen to the head” and keeps surreptitiously balancing his leg on the gym equipment behind him, I don’t think I’ve got anything to worry about. 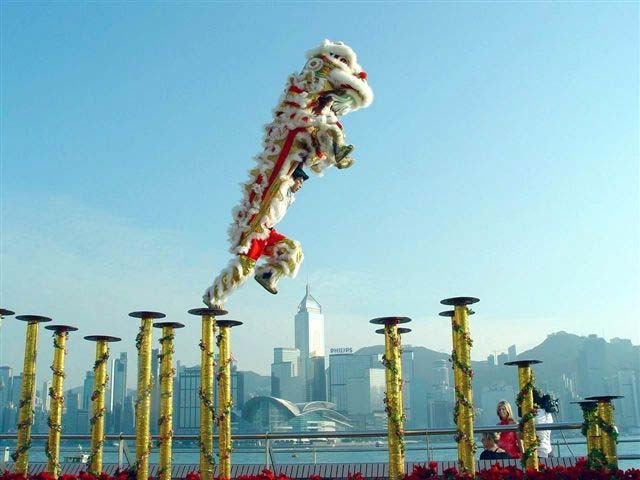 The 7kg lion heads are made of papier-mâché and bamboo, with a string operating eyelashes and ears. To animate the mouth you need to balance the head on your arms so that you have a hand free. As the performer’s sight is limited, clowns tumble alongside the lion so that their feet are always in the peripheral vision. The drums start up and suddenly all the stances we’ve run through make sense, as the stronger members take up the costumes and run the motions into a fluid, thigh-punishing dance. While the musicians practise their percussion outside, there are about six lions on the go in the clubhouse, including a pink and white one… for the ladies. Australian local Kate has risen through the ranks and is busting a gut leaping and crouching at the head of one lion, alongside considerably more muscle-bound guys. The dance involves accepting an offering made by a shopkeeper or restaurant proprietor, giving it a good chew, then spitting it out. An offering might be a lettuce, orange, live eel, or – rather inconveniently for the dancers, who end up quite bloodied – live crab. Sometimes there’s beer, which gets sprayed around liberally. Whatever the offering, if you end up splattered with it, that’s really good luck. There’s a ranking system here – one to three stripes, followed by a flower – and the three-stripers are concentrating on leaping atop platforms of varying heights, in a death-defying fashion. 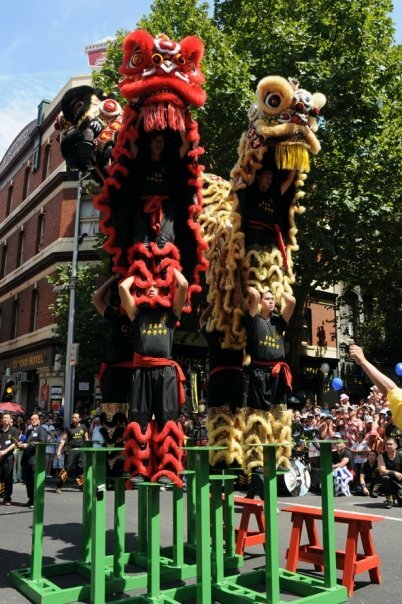 The tail performers lift the head dancers onto their legs and shoulders and they land by rolling together on the floor. It’s brutal stuff, and any misses – particularly involving steel platforms – will be remembered for weeks to come. Huy and I decide to sit this part out. And next to the meat pie table and sausage sizzle seems as good a place as any to sit. The CYSM crew in action. Keeper? Verrry tempted to beg them to adopt me. And will definitely practise the ‘horse’ stance in the privacy of my own home. 2 x Actual LOL. Yes! Hey Jenny you should totally join CYSM long term! I’m part of CY myself and it is awesome!